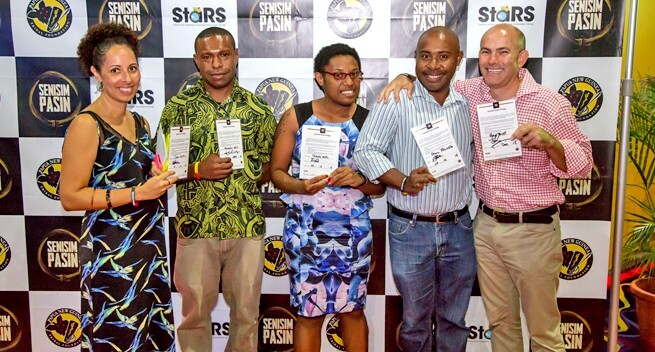 The film Senisim Pasin is a powerful and urgent call to action that shines a light on family and sexual violence in Papua New Guinea and explores solutions that each and every one of us can help drive. Oil Search will partner with the Tribal Foundation to screen their newly-produced film for Oil Search employees and the communities where they live and work. Senisim Pasin tells the story of the ongoing challenges PNG faces and seeks solutions so that individuals and communities can be empowered to create change. Oil Search committed in 2015 to a five-year Women’s Protection and Empowerment (WPE) Strategy which will see the Company partner with organisations that use innovative solutions to end violence. Senisim Pasin aligns with Oil Search’s objective to achieve a PNG with gender equality in which women are empowered to live productive lives free of violence. At this week’s PNG Women’s Forum in Port Moresby, Director of the Oil Search Foundation board, Stephanie Copus-Campbell conveyed a clear message about the need to focus on solution driven approaches. “It’s generally known today that there is a problem with violence in PNG and elsewhere. What we need to do now is find everyday solutions to end the violence. And this means supporting Papua New Guineans to implement those solutions that work best for them,” she said. The partnership with the Tribal Foundation will encourage Oil Search employees and communities to get involved. Senisim Pasin’s roll-out is a call to action and part of a comprehensive campaign to create a safer PNG. Viewers should strongly consider pledging to end violence against women and girls and utilising tools provided by the Tribal Foundation to really make a difference in their communities.